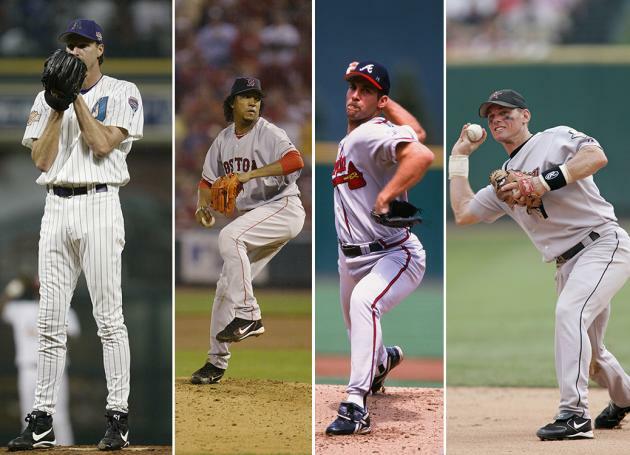 NEW YORK — Randy Johnson, Pedro Martinez and John Smoltz, a trio of star pitchers who dominated in an era of offense, were elected to baseball’s Hall of Fame on Tuesday along with Craig Biggio, the first time since 1955 that writers selected four players in one year. Johnson, Martinez and Smoltz easily earned induction on their first tries, and Biggio made it on his third attempt after falling two votes shy last year. Steroids-tainted stars Roger Clemens, Barry Bonds, Mark McGwire and Sammy Sosa remained far from election. Johnson, a five-time Cy Young Award winner with 303 victories and 4,875 strikeouts, was selected on 534 of 549 ballots by veteran members of the Baseball Writers’ Association of America. “The Hall of Fame was never something that I surely ever thought about,” said Johnson, who has been pursuing a photography career since his retirement. The 97.3 percentage for the left-hander was the eighth-highest in the history of voting. Martinez, a three-time Cy Young winner, appeared on 500 ballots (91.1 percent). Martinez was 219-100, struck out 3,154, led the major leagues in ERA five times, and in 2004 helped the Boston Red Sox to their first World Series title in 86 years. Martinez also became the second player from the Dominican Republic elected to Cooperstown, joining Juan Marichal (1983). Smoltz was picked on 455 ballots (82.9 percent) and will join former Atlanta teammates Greg Maddux and Tom Glavine, who were inducted last summer along with Chicago White Sox slugger Frank Thomas. Smoltz, the 1996 NL Cy Young winner, was 213-155 with 154 saves, the only pitcher with 200 wins and 150 saves. “I’m honored, I’m humbled, and when the phone call came I was, for the first time ever, speechless,” Smoltz told MLB Network. Smoltz also went 15-4 in the postseason, helping Atlanta reach the World Series five times and win a championship in 1995. “The only thing I think that all of us regret a little bit is that we didn’t execute enough to deliver enough championship rings, especially for our manager [Bobby Cox],” he said. Biggio appeared on 454 ballots, 42 more than the 75 percent needed and up from 68.2 percent in his first appearance and 74.8 percent last year. He had 3,060 hits in 20 big league seasons, all with the Houston Astros. The quartet will be inducted in Cooperstown on July 26. The BBWAA had not voted in four players in a single year since selecting Joe DiMaggio, Gabby Hartnett, Ted Lyons and Dazzy Vance 60 years earlier. Clemens received 37.5 percent and Bonds 36.8 percent. Clemens, the only seven-time Cy Young winner, started at 37.6 percent in 2013 and dropped to 35.4 last year; Bonds, the only seven-time MVP, began at 36.2 and fell to 34.7. McGwire, in his ninth and next-to-last year of eligibility, received 10 percent, down from 11 last year and less than half his peak of 23.6 percent in 2008. Sosa was on 6.6 percent of the ballot, down from 12.5 in 2013 and 7.2 last year but above the 5 percent threshold for remaining on next year’s list. ESPN MLB analyst Keith Law reacts to the elections of Randy Johnson, Pedro Martinez, John Smoltz and Craig Biggio to the Baseball Hall of Fame and more. Jeff Bagwell was at 55.7 percent, followed by Tim Raines at 55 percent and Curt Schilling at 39.2 percent. Other players included Lee Smith (30.2), Edgar Martinez (27), Alan Trammell (25.1) and Mike Mussina (24.6). Don Mattingly received 9.1 percent in his 15th and final appearance on the ballot. Under a change made by the Hall’s board last summer, players’ eligibility was cut from 15 years to 10, but the 11-15 group was grandfathered. Gary Sheffield (11.7 percent) and Nomar Garciaparra (5.5) will remain on the ballot. Among the 17 first-time eligibles who will be dropped are Carlos Delgado (3.8 percent) and players’ association head Tony Clark, who did not get any votes.